German ichthyologist and physician; born at Ansbach in 1723; died in Carlsbad Aug. 6, 1799. His parents, being very poor, gave him hardly any education, so that on arriving at manhood he was almost illiterate, and till the age of nineteen could not even read German. Some knowledge of Hebrew and rabbinical literature enabled him, however, to obtain a teacher's position in the house of a Jewish surgeon in Hamburg. Here he learned German thoroughly and mastered some Latin, taking up also the study of anatomy. Scientific enthusiasm being thus aroused, Bloch went to Berlin, where, with remarkable zeal, he devoted himself to the study of all branches of natural science and medicine, being supported by some relatives. After taking the degree of M.D. at Frankfort-on-the-Oder in 1747, he settled in Berlin and practised his profession for many years. In 1774 Bloch published a volume of medical treatises, "Medicinische Bemerkungen, Nebst einer Abhandlung vom Pyrmonter Sauerbrunnen," Berlin, 1774; but after that he devoted himself almost exclusively to research in natural science, especially in ichthyology. Travel increased his knowledge, and he made a fine collection of specimens of fishes, which, upon his death, was acquired by the Prussian government and presented to the Academy of Science, now to be seen in the Berlin Zoological Museum. In 1781 Bloch published "Die Oekonomische Naturgeschichte der Fische Deutschlands, Besonders des Preussischen Staates," followed in 1782-84 by "Oekonomische Naturgeschichte der Fische Deutschlands"; and during 1785-95 these works were completed by his "Naturgeschichte Ausländischer Fische." These series of publications, under the general title "Allgemeine Naturgeschichte der Fische," Berlin, 1781-95, 12 vols., provided with 432 excellent plate-illustrations, formed the principal work on ichthyology in the eighteenth century. 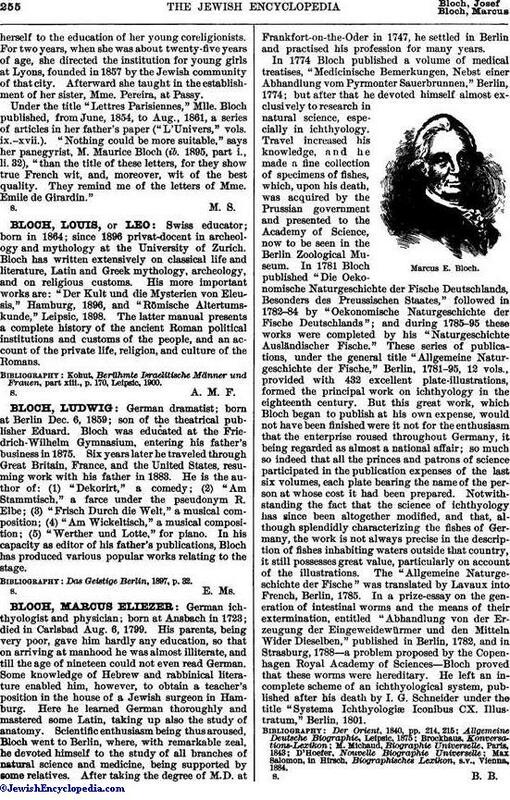 But this great work, which Bloch began to publish at his own expense, would not have been finished were it not for the enthusiasm that the enterprise roused throughout Germany, it being regarded as almost a national affair; so much so indeed that all the princes and patrons of science participated in the publication expenses of the last six volumes, each plate bearing the name of the person at whose cost it had been prepared. Notwithstanding the fact that the science of ichthyology has since been altogether modified, and that, although splendidly characterizing the fishes of Germany, the work is not always precise in the description of fishes inhabiting waters outside that country, it still possesses great value, particularly on account of the illustrations. The "Allgemeine Naturgeschichte der Fische" was translated by Lavaux into French, Berlin, 1785. In a prize-essay on the generation of intestinal worms and the means of their extermination, entitled "Abhandlung von der Erzeugung der Eingeweidewürmer und den Mitteln Wider Dieselben," published in Berlin, 1782, and in Strasburg, 1788—a problem proposed by the Copenhagen Royal Academy of Sciences—Bloch proved that these worms were hereditary. He left an incomplete scheme of an ichthyological system, published after his death by I. G. Schneider under the title "Systema Ichthyologiæ Iconibus CX. Illustratum," Berlin, 1801. Max Salomon, in Hirsch, Biographisches Lexikon, s.v., Vienna, 1884.